Moment Of Truth (MOT) – as defined in the dictionary. I first heard the term (MOT) during my training at the Taj more than two decades ago. I have been talking about it in my classes and training sessions ever since. I’ll not elaborate on Mr. Jan Carlzon or the Scandinavian Airlines System explaining MOT but will highlight my own experiences at The Park Kolkata recently. Is the flagship property of the Apeejay Surrendra Park Hotels Ltd. The Kolkata propety, TPCL – has achieved an Iconic status. Ubercool and stylish since its inception; today more than five decades later-revamped and restyled, the hotel remains one of the coolest places to be around town. Launched in 1967, the year that the Beatles toured India, this luxury five star Hotel wears a chic new look today. The dramatic Lobby, created by the world-renowned design gurus Conran & Partners, puts forward an inspiring vocabulary, unique to The Park Hotel Kolkata, breaking most conventional notions. Witness bold innovation and chic luxury in all its rooms, restaurants and other public spaces. The hotel’s 149 rooms reveal iconic luxury business hotel accommodation and signature boutique presence, with plush, elegant decor and modern facilities reflecting the rich history of art and architecture of the city. Lavishly furnished and combined with five star boutique services, it has a variety of indulgent options available to those either on a Business trip, a Leisure trip or even just a weekend getaway. There are exciting after hours entertainment options, the best that a five star Kolkata hotel has to offer, and indulge in a variety of wining, dining and partying selections. The sprawling banquet halls, the luxury day spa, Aura, the state-of-the-art gymnasium, beauty salon, soothing sauna and steam chambers, poolside juice bar , an outdoor swimming pool and Jacuzzi complete the innovative, international and inspired experience for the guests staying in the lap of luxury at The Park Kolkata! Part of my job is to visit various hotels of the group and this time it was at TPCL. I was there last month end for a week long training schedule. I was looking forward to this particular visit as it was almost after a decade I was going back to the hotel where my own induction/ cross training happened when I joined the company in 2007. The training manager Mr. Junaid Majid Sheik got in touch with me, discussing training topics and logistics. He booked me in my favourite airline, Indigo (for on time arrival almost always). Reserving my favourite seat and had even the preferred meal pre booked. He sent me the chauffeur details for pick up even before I left home for airport. I was received by the hotel’s airport representative even before I reached the luggage belt for picking up my baggage. This was one of the firsts in my own experience. He promptly guided me to the car and the moment I sat down, the training manager called to confirm if all was fine. I asked him to relax as it was Sunday and that I’d see him the next morning. When I reached my accommodation he called again this time telling me to enjoy the dinner placed in the room (as I had asked for the same). Next morning he met me for breakfast before the training session. The reason I elaborate the entire arrival experience here is to reiterate how every touch point contributes to the positive Moment of Truth. The customers and guests love it when they feel cared and they become the fans of the business! 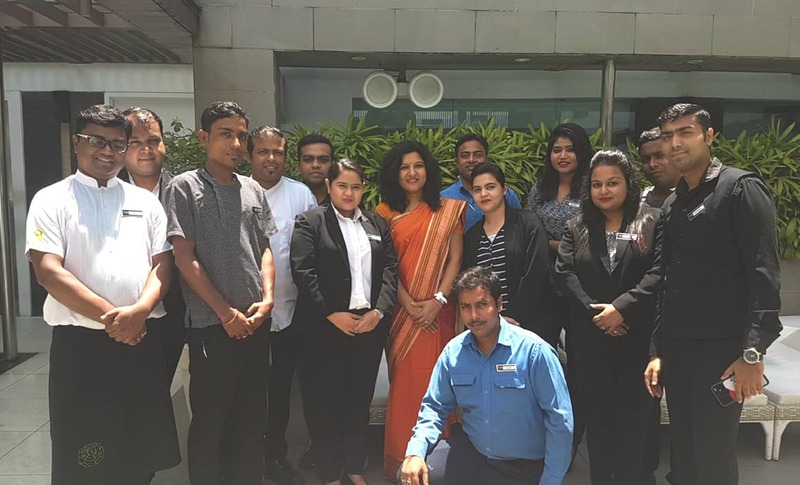 Its not just that I had only a fantastic arrival experience but the whole stay as well as the training sessions have been truly engaging – things that I thoroughly enjoyed. 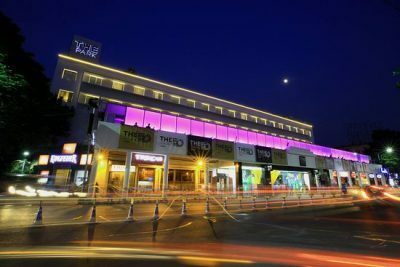 This hotel is special to me as when I joined this organisation, TPCL actually gave me the feel of a popular boutique hotel and it’s people culture. It still is the same, in fact it has got better over the years. The hotel also has an equally fantastic team. The GM Mr. Pramode Bhandari met me before I started my first training session introducing me to the group. He spoke about the importance of training in customer engagement, topic I was covering in my session. Its a delight to work with teams that understand the importance of training. The organisation has a strong culture of Learning and Development and have academic affiliations with the best universities around the world- Harvard Business School, University of Singapore, Cornell University or IIMs back home. Mr. Dewan, our MD has spoken about the commitment of the company to developing it’s people on many occasions. Had full day training sessions and evening was meant to visit the different award winning restaurants, bars and night clubs of the hotel. It still retains it’s number one spot in the city for the best bars. Tantra, Roxy, Someplace Else and Aqua are truly iconic and so is Flurys. I managed to have breakfast there – the famous Flurys breakfast; this place has a great fan following. 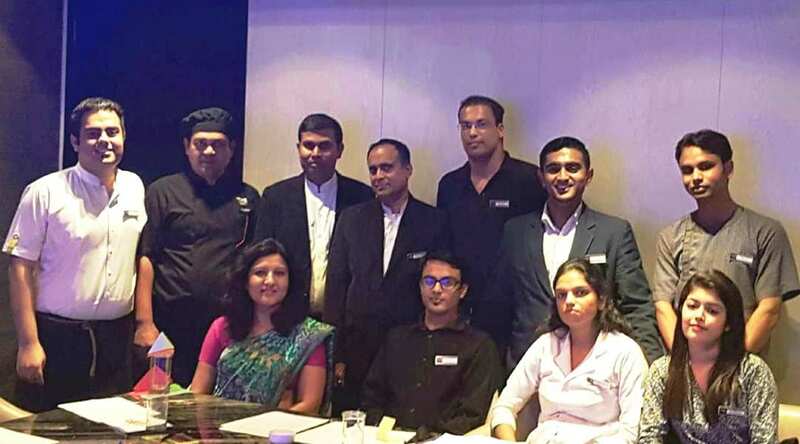 Chef Sharad Dewan knows how to create magic with food and he does it all the time, with his team. Every restaurant had something delectable to offer. I also use the time to acquaint myself with the new trends and latest happenings from the managers I meet. Had impactful conversations with Mr. Rajnish Rao about bars and promotions. Met the EHK Mr. Raja Mustafi who spoke about the use of robots in housekeeping. The participants too shared good deal of knowledge, information and updates; true to the saying that; training is a two way process – you teach and you learn a lot more! VP HR Ms. Sujata Guin is so pro training and L and D; it was great to hear her vision of employee learning and engagement. 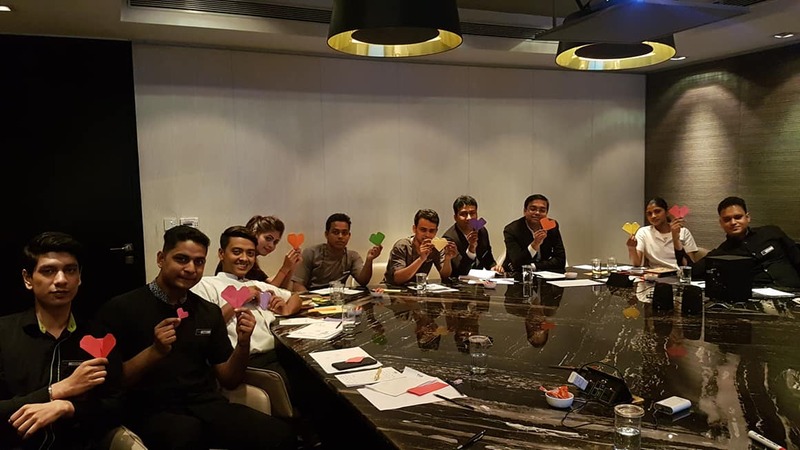 Icing on the cake of any hotel visits is meeting the Management Trainees. 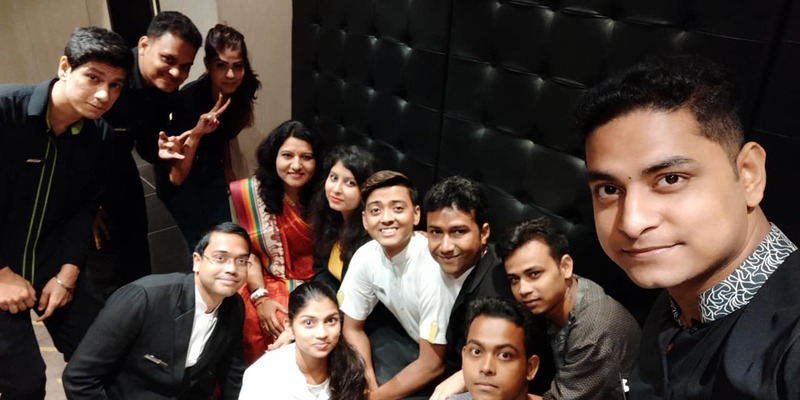 This time too I met the past and present batches, it’s a pleasure to see their progress or simply meet them as they embark on their professional journeys at Apeejay Institute of Hospitality – the learning centre of the Park Hotels, my work place. I have had many positive Moments of Truth on this visit to Kolkata – the city of joy. The city has changed too, it looked modern and beautiful specially the New Town area near the airport. Kolkata now boasts of a good balance of heritage and modernity. The yellow ambassadors are a delight to see. I bring back many fond memories and …..sweets with me on my way back home!